What is CPR? Cardiopulmonary Resuscitation. What is an AED? An automated external defibrillator (AED) is a portable electronic device that automatically diagnoses the life-threatening cardiac arrhythmias in a patient, and is able to treat them through defibrillation, the application of electrical therapy which stops the arrhythmia, allowing the heart to reestablish an effective rhythm. 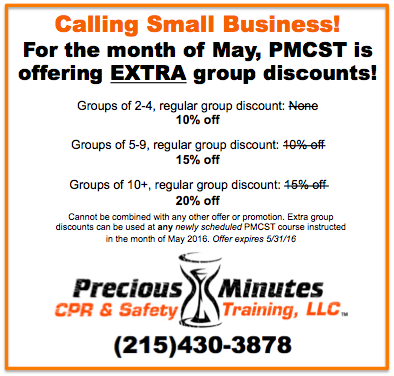 Are your courses OSHA compliant? Our AHA Heartsaver Courses are for anyone with limited or no medical training who needs a course completion card for job, regulatory or other requirements. While these courses are designed to meet OSHA requirements, OSHA does not review or approve any courses for compliance. Through the AHA/OSHA Alliance, we work with OSHA to raise awareness about workplace safety and health to prevent injuries, illnesses, and fatalities in the workplace. 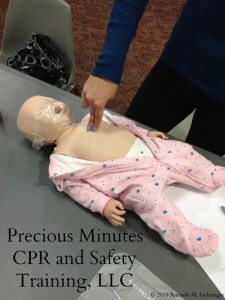 Which CPR course should a “first responder” or “professional rescuer” take? First responders or professional rescuers generally include fire, police and emergency medical personnel. These types of prehospital professionals usually need to complete a BLS course. Which course should a daycare provider take? The AHA’s Heartsaver Pediatric First Aid CPR AED Course is designed to meet regulatory requirements for child care workers in all 50 United States. The AHA offers this course in both classroom-based and eLearning formats. The AHA offers a variety of eLearning courses through OnlineAHA.org and our Distributors. For CPR and first aid courses, an eLearning course must be followed by a skills practice and testing session with an AHA Instructor within 60 days of completion and has an additional cost. Do the AHA’s BLS courses include first aid? For the purposes of AHA’s CPR and first aid training, what age constitutes an infant, child and adult? – All ECSI First Aid/CPR/AED courses. 1. Students will not receive their eCard via email or physical certification card(s) via USPS until Precious Minutes CPR and Safety Training, LLC has been paid in full. 2. All returned checks are subject to a $35 fee. 3. There is a $20 fee for AHA BLS and a $35 fee for AHA Heartsaver replacement (physical) certification cards. We understand that “life happens” but please notify us ASAP with any cancellation or rescheduling needed. 4. PMCST always goes above and beyond to ensure our courses are not cancelled for any reason, but unfortunately due to severe weather or other emergencies there may be occasions when we must cancel a course. If a course is cancelled by us or our public location, you will be notified ASAP via telephone and/or email. At that point you may choose to take a class on a different day or receive a full refund within 2-4 business days.